The MAGIC tricks of Atlanta’s The Jolly Jester will fool you, but its primary purpose is to ENTERTAIN you! You can book this special magician with his sleight of hand tricks in Atlanta by calling Blue Sky Atlanta Music & Entertainment at (678) 467-8263. Humor is the key, as spectators from three to ninety-three will enjoy the laugh-provoking legerdemain – real sleight of hand magic tricks . A special highlight is the Close-Up Magical Conjuring featured at every show, mingling among small groups, completely surrounded, captivating the crowd with the fact that The Jolly Jester fooled us right under our noses. “I’ve never been this close to a magician!” Having been thoroughly warmed up, your guests will welcome the stand-up cabaret style show for the entire group that follows, highlighted by the audience volunteers joining in the fun on stage – their reactions are a show in itself! From start to finish at your event, The Jolly Jester is a featured guest and magician, becoming the Life of the Party, as this polished prestidigitator with his sophisticated sorcery produces the electricity and excitement that will make your function a memorable experience for your clients, guests and friends – a magic event! Quote: Call (678) 467-8263 for pricing and availability. The Golf Connection: The Jester’s love of golf has served him well in meeting the entertainment needs of a great percentage of our clients – many golf club member-guests, professional tournament hospitality, charity golf outings, amateur events and golf resorts, and the resulting corporate events and private functions generated by these performances. 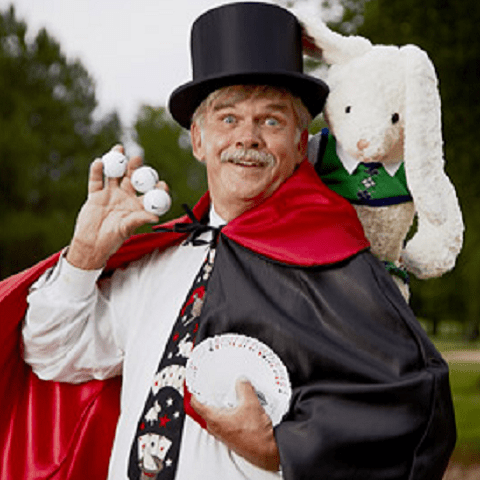 He is a low-handicapper at East Lake (home club of Bobby Jones) and he has played many of the top 100 golf courses – his skill and many golf experiences combined with the magic make him perfect for any golf event. Golf has taken The Jolly Jester around the world, with performances from Hawaii to the Caribbean, Canada, England, Ireland and Scotland – scene of his most Magical Moment – Old Course at St. Andrews – a HOLE in ONE and level par 72!